Armed with her mantra, “Spritz all day, party all night,” Maggie has designed three cocktails to warm up your getaway this holiday season. For this version of the negroni, vermouth is swapped for bergamot and cinnamon tea, bittersweet aperol, and gin. Yields three cups of tea. Maggie’s special note: My wish is that you enjoy your own taste of “aperitea-vi” as you getaway! To brew the tea, fill stove pot with cinnamon sticks, sugar, orange peel, orange juice, and water and bring to a boil. Once water is at boiling temperature, add two bags of earl grey tea and let steep for five minutes on a low simmer. Double strain tea into teapot or serving container. Add one part (1 oz.) aperol, one (1 oz.) gin, and four (4 oz.) parts orange tean in a cup. Stir. Toss in a slice of orange and cinnamon stick for garnish. Sip by a cozy fire. 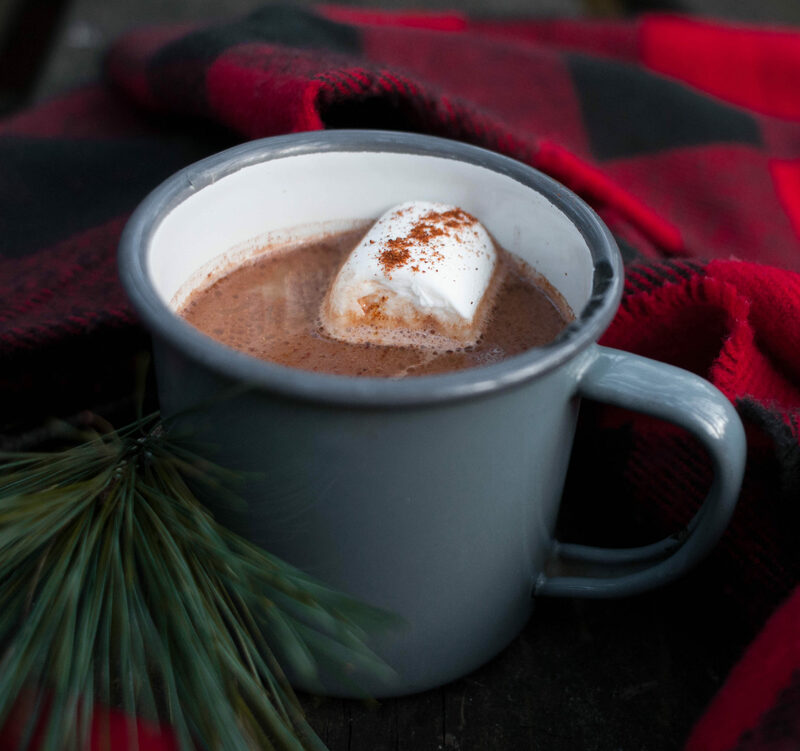 As a young camper, Maggie and her friends would sneak off to a hidden beach at night, build a campfire, and make “Midnight Cocoa” with melted chocolate and marshmallows. This recipe includes cayenne for a rich and spicy twist on the classic. Yields two servings. Non-alcoholic. Bring macadamia milk and cinnamon to a simmer in a medium saucepan over medium-low heat, whisking occasionally and ensuring milk doesn’t boil (around 10 minutes). In a double broiler, melt semi-sweet chocolate bars on low heat to avoid burning. To save time, substitute cocoa powder for melted chocolate. Whisk in chocolate, vanilla, and cayenne. Cook on low heat, whisking frequently, until mixture is smooth and creamy and chocolate is melted (about five minutes). This is a take on an old-fashioned, but orange bitters are replaced with citrus- and cola-notes of Averna Amaro and Brovo Amaro. Clove, cardamon, and cinnamon finish the drink off for a hint sweetness. Add ingredients to a mixing or pint glass. Add ice. Stir for 20-30 seconds and strain over fresh ice. Garnish with orange peel and clove. Wear your favorite sweater and enjoy! You can follow Maggie and her mixology adventures at The Spritz Co. Make and drink these delicious beverages by the campfire as they were intended when you book your Getaway here.